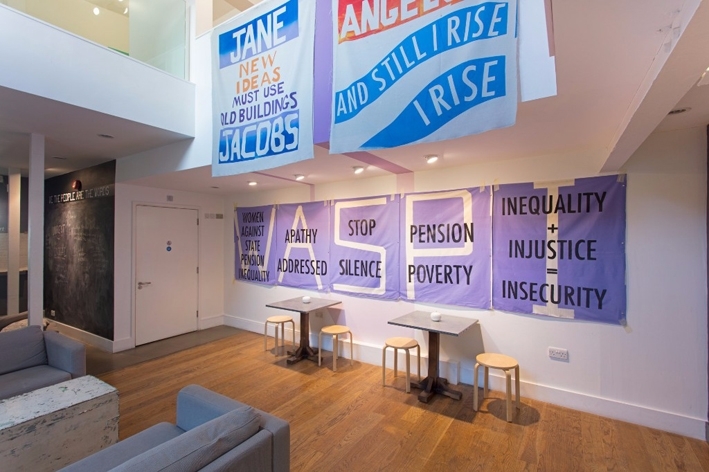 This exhibition is part of We The People Are The Work, a major visual arts project in Plymouth that will explore ideas of power, protest and the public. Ciara Phillips uses the discipline of printmaking to explore social concerns and develop collaborative practices. Regularly opening up her exhibitions as working print studios, she uses them as places for investigation, social action, discussion and debate. In Plymouth Phillips has made a major new installation that takes over the multiple galleries and social spaces of Plymouth Arts Centre to turn them into a production space exploring the intersection of the personal and the political where she will work live in the exhibition with groups of women from the city to produce printed textiles to represent their voices and concerns. I was part of one of the groups of local women who discussed and created work in response in influential female figures.